Instantly reversible and capable of operation in either direction. 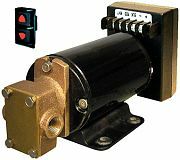 Relatively low flow (less than vane pumps) makes them suitable for duties such as deck-wash, fuel transfer, ballast transfer, and oil change. Ignition protected motor and 316 stainless steel shaft. Includes remote/momentary/reversing rocker switch. 1-1/2" to 3 GPM, 55 PSI, 3/8" NPT, 12 volts.